It's probably no secret that my kids and I absolutely, positively love the Grinch. In fact, you might remember my DIY Grinch Ornaments and T-Shirts posted over the holiday season. We were SO excited over the theatrical release of the all new 'The Grinch' movie that we just had to keep the celebration going! And now that it's being released on Bluray, DVD and Digital, the celebration continues. Now, unless we've been living under a rock... we all know the story of The Grinch. This grumpy character hates Christmas and decides to ruin for all the Whos down in Whoville by...well, stealing their Christmas. But in the end, he has a change of heart and learns the true meaning of Christmas. Is it any wonder that it's a classic? 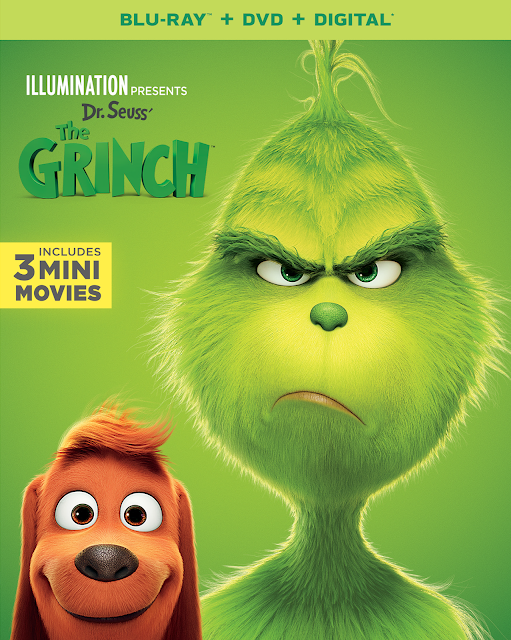 This new movie from Illumination stays very much in line with that classic story, of course, but expands on it with new laughs, new characters and new fun. My kids and I absolutely LOVED this movie when we watched it in the theater back in November. It had the heart (no pun intended) that we loved so much from the original... along with the silliness that we've come to love and expect from Illumination Films. While I will still say that the original cartoon is the best and cannot be beat, we certainly enjoyed it more than the live action version. My kids and I always enjoy the special features of movies we love, and this one did not disappoint. They especially loved the Mini-Movies...giving them more entertainment to enjoy. The lyric videos were also a big hit. I know that when Christmas DOES come around again, we will especially enjoy some of the more holiday themed features too, but we're saving them for that time. Ready to bring home 'The Grinch' for your family? It will be available on Bluray/DVD on February 5th, and can be preordered now.